The word “phases” is a massively misunderstood electrical concept among those untrained in electricity. The misunderstanding greatly complicates discussions that transition back and forth from three-phase distribution systems to single phase end user systems. It is widely misunderstood among “do-it-yourself” laymen who get their electrical training from salesmen at big box stores or “off the Internet.” In fact, it is often misused and misunderstood by people who should know better (electricians). Electrical laymen learn an incorrect concept through incorrect common usage, and then swear to the death that it is true. It is not. Consider a train arriving at a station. To the observer standing on the station platform, the train appears at first to be approaching, then it passes, then appears to be moving away. But to a passenger on the train, the train was always traveling in the same direction on the tracks. The appearance of approach and withdrawal to the observer on the station platform was an illusion created in the mind of that observer, and had nothing to do with the actual movement of the train on the tracks. So it is with “phases” in single phase, three wire, mid-point neutral system! In North America, 60-cycle, three phase generating stations (abbreviated “3-phase,” often “3-Ø” on circuit diagrams) and a 3-phase power distribution grid are the absolute standard. Three phase power is commonly used in industrial and commercial applications; it’s unusual, but possible, to have three phase power in single family residential dwellings. Three phase power is actually quite common in apartment, condo and town house multifamily dwelling buildings, which are seen by the electric power grid as commercial buildings. Three phase power is also quite common in marinas and boatyard facilities. This is the subject of another post on this site, here: https://gilwellbear.wordpress.com/category/boat-technical-topics/electrical-topics/boat-ac-topics/208vac-electrical-systems-at-marinas/. Regardless of how power is supplied to the building, single phase circuits power the overwhelming majority of residential applications. Single phase residential AC electricity comes into a building from a transformer. The primary winding (input) of the transformer connects either between one leg of a 3-phase primary distribution network and the 3-phase system’s neutral, or between two legs of the 3-phase system’s network. That transformer is usually located on a pole (or underground) at the street. The secondary winding (output) of the transformer provides the connection to the building. The “secondary” is a single coil with an electrical connection at it’s physical and electrical mid-point; it’s physical and electrical “center.” In North America, that “center tap” is referred to as the “grounded neutral,” or simply “neutral,” and the two respective ends of the winding are each referred to as “hot” lines. The neutral is tied to (bonded to) earth ground at the main service panel in the building, and that provides a fixed, known electrical reference point for the system throughout the building. In written articles and on electrical diagrams, the neutral is abbreviated “N,” and the hot lines are abbreviated “L1” and “L2.” This connection topology, or configuration, is a “single-phase, 3-wire, center-tapped, mid-point neutral” system. The voltage between L1 and L2 is nominally 240VAC. The voltage between the neutral, N, and either one of the hot lines, L1 or L2, is nominally 120 VAC. The hot lines and the neutral are “current-carrying conductors.” The safety ground is not normally a current carrying circuit component, and does so only if a fault condition is present in the electrical system. This above configuration is often – incorrectly – referred to as consisting of “two phases.” Two-phase output does not emerge from a single, continuous transformer secondary. The concept here is widely misunderstood, even by some electricians. The cause of the confusion is the manner in which measurements are commonly made. In a grounded neutral system, the measurements are virtually always taken using the grounded neutral as the measurement reference. Performed in that manner, the measurement reference point would be the center tap, or the point in the middle of the transformer’s secondary winding; i.e., not at one of the winding’s origin or terminus points, L1 or L2. Measured in that way, the result is that one half of the winding will appear backwards when compared to the other half. If an oscilloscope is connected to initially measure the voltage waveform with its negative probe at L1 and its positive probe at the center tap (CT), and then a second measurement is taken by moving both probes so the negative probe is relocated to the CT and the positive probe relocated to L2, the two voltage waveforms would appear correctly, in-phase with each other. If, on the other hand, an oscilloscope negative probe is connected at the CT, and measurements are then taken by moving only the positive probe, first to L1 and then to L2, the respective voltage waveforms would appear 180° out-of-phase WITH RESPECT TO THE CENTER TAP; i.e., one of the waveforms would appear “backwards” in comparison to the other. This false indication reflects the error in measurement methodology, and creates the appearance of the waveforms being out-of-phase. This is a measurement anomaly only. Again, you do *not* get two-phase output from single phase input. Another way to look at this is by considering the magnetic field that rises and falls in the power transformer feeding the boat (or residence). There is only one magnetic field in that transformer. It rises and falls in time with the rise and fall of the incoming primary voltage waveform. That single magnetic field is what induces the output voltage on the secondary winding of the transformer. For a secondary winding with one or more taps, or in this case, a single tap (neutral) at the electrical midpoint of the winding, the overall polarity of that rise and fall must be seen in the context of the entire secondary winding. It cannot be opposite in one part of the same winding. In the same way that the train moves in one direction along a track, the magnetic field affects all parts of the same winding in the same way. Where the observer stands – where the measurements are taken – affects the observer’s perception; the illusion of the phenomena being observed. The lay public and some residential electricians routinely refer to the two halves of a 240V circuit as “Phases.” It’s a “terminology shortcut” like so many we use in everyday conversation. In actual practice, there’s probably nothing wrong with that as long as the underlying concepts are clearly understood. I personally prefer to call the two circuit halves “legs;” i.e., leg 1 circuits and leg 2 circuits (for L1 and L2). 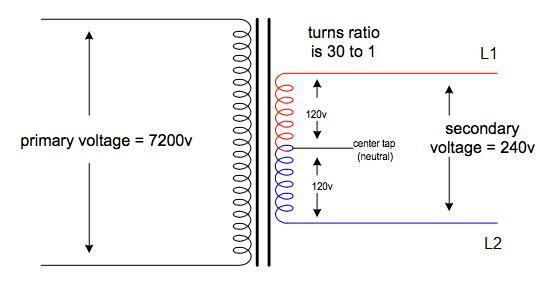 The important concept, though, is that a 240VAC residential circuit is not a two-phased circuit. This entry was posted in "Phase" Terminology Misunderstanding, Boat AC Topics on 2013/01/12 by gilwellbear.